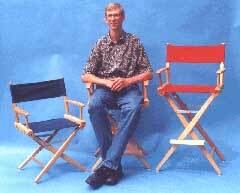 These Director's Chairs are available in three heights: 17", 24" and 30", to fit people of all sizes! The 24" Director's Chair is great for Paul, and our average sized friends can sit in the same directors chair and use the handy foot rest while Paul has his feet on the ground, allowing us both to be comfortable! This World Famous Directors Chair is soundly constructed using the finest solid North American hardwood. Made in the U.S.A. by Telescope Casual, this is the finest directors chair in the industry. Canvas covers are custom dyed with the finest vat dyes available. Arms are shaped and sanded by hand for maximum comfort and smoothness. The heavy duty shaped legs and corner bracing on the 24" and 30" height chairs set them apart from the crowd. The directors chair fold compactly and pack easily. They are available in four frame finishes and a variety of color choices for the canvas covers, all shown below. Please allow 1-2 weeks for delivery. "I was extremely happy with the service I received and would definitely recommend Tall Paul's to anyone in the market for big/tall items." "They help with everything you need, they make sure your order is right before shipping - even by referring to an old order. Great people." "The chairs that I bought from Tall Paul’s was just what I've been looking for, for along time. Thank you so much." "Received a prompt telephone call and e-mail from a Tall Paul customer service representative answering a question I had about the fit of the item I purchased... Great customer service! Thanks."